I’m sure most of you twitterpated twi-hards out there are absolutely spazzing about Twilight Saga Breaking Dawn Part 2. Stars all the way from Rob and Kristen down to Booboo and Fivel Stewart were dressed to the 9’s for the world premiere of the movie this past week. 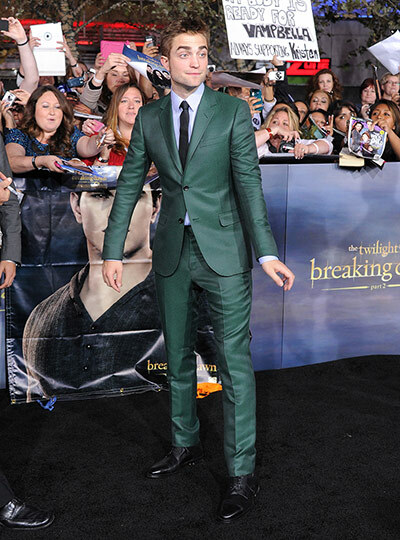 Wanna steal Rob’s look in a girly chic way? Grab yourself one of these cute blazers, a simple top, some skinny slacks, killer accessories, and of course some kickin’ shoes to polish off this classy tom girl look. This sassy vamp really knows how to make a statement! Judi Shekoni looks phenomenal. If you’re not drooling over this Ilja Visser beauty maybe you’ll drool over its just as cute, less expensive cousin. While Kristen looked stunning in this Zuhair Murad gown, we’re not crazy about wearing floor length see through lace unless you’re a vampire. As well, we support wearing your gorgeous Jimmy Choo’s if you’re lucky enough to have them. But we’d really like you to resist. We vote that instead you opt for a cute sheer lace dress like this and leave the visible underwear far far behind you. Enjoy and please wear red carpet styles responsibly.